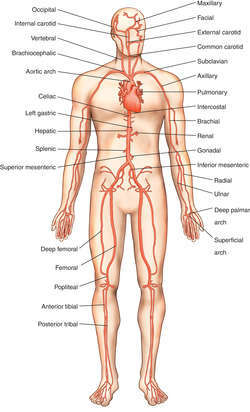 origin, subclavian; branches, pericardiacophrenic, anterior intercostal, sternal, mediastinal, thymic, bronchial, muscular, and perforating branches, and bifurcates into the musculophrenic and superior epigastric. 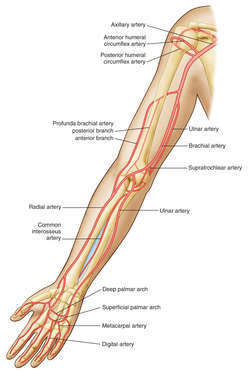 one of a pair of arteries that arise from the first portions of the subclavian arteries, descend to the margin of the sternum, and divide into the musculophrenic and superior gastric arteries at the level of the sixth intercostal space. 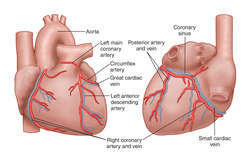 The artery supplies the pectoral muscles, the breasts, the pericardium, and the abdominal muscles. 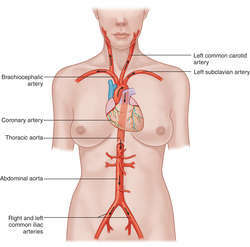 In females, it is also called the internal mammary artery. It is interesting to note that among the first uses of the internal thoracic artery for myocardial revascularization negative clinical results were found attributed to limited blood flow (Singh et al. Thus, it is recommended that the internal thoracic artery be viewed specifically in diagnostic coronary angiograms when the use of this artery is considered for myocardial revascularization (Feit et al. The effect of bilateral internal thoracic artery harvesting on superficial and deep sternal infection: the role of skeletonization. Assessment of sternal vascularity with single photon emission computed tomography after harvesting of the internal thoracic artery. Right coronary artery revascularization in patients undergoing bilateral internal thoracic artery grafting: comparison of the free internal thoracic artery with saphenous vein grafts. Age cut-off for the loss of benefit from bilateral internal thoracic artery grafting. Improved survival with multiple left-sided bilateral internal thoracic artery grafts. Skeletonization of bilateral internal thoracic artery grafts lowers the risk of sternal infection in patients with diabetes. Pleuropulmonary morbidity: internal thoracic artery versus saphenous vein graft. 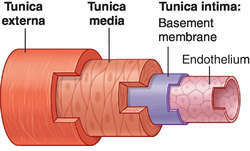 Effect of different methods of internal thoracic artery harvesting on pulmonary function. Effect of skeletonization on flow and length of internal thoracic artery. In order to shorten the operative time, it is advisable to harvest the RA in conjunction with the takedown of internal thoracic artery for CABG.